We are one team with only one mission: " Make your transitioning in to Parenhood, the Most enjoyable and pleasant experience"
We hired Veronica Hinojosa-Stang as our Postpartum Doula and Travelling Baby Nurse and this letter is to show my appreciation for the help provided to my family during the birth of our son. I went from Washington Dc to Los Angeles to deliver my 3rd child .I conducted various interviews to find a Baby Nurse and knew that I would hire Veronica right after I met her. Veronica has decades of experience in the care of newborns and infants. She is professional, responsive and always eager to help. With a new newborn, I had to travel back to Washington on a 6 hour flight. I decided to take Veronica with the family. Veronica took impeccable care of the baby at the airport during the entire check in/security (3 hours) and duration of the flight. The baby did not even cry once! and seemed very comfortable on her arm for almost 11 hours straight. It was amazing how Veronica handled the entire journey with a great sense of humor. Veronica was extremely professional in the care of our baby since he was born. I really appreciated that Veronica takes her time feeding the baby and ensures that he is properly burped and stomach settled before putting him down (this can take up to 1.5 hours at a stretch every 3 hours or so!). I was also assisted by Veronica on the various ways to ensure that the baby latches on and given tremendous support on overall lactation issues. This was a difficult learning process and I could not have managed without Veronica’s assistance. Veronica always makes sure that the bottles are properly cleaned and with the free time available, also manages to do the baby’s laundry and even helps in the kitchen and gets the time to interact with my other 2 daughters ages 5 and 2. As a Postpartum Doula, she did a great job looking for the well-being of the whole family as a unit. She was able to share some of her time with my other 2 kids and played, danced and read some books. My daughters learned a little bit of Spanish in her short visit with us which was amazing. Veronica is highly energized, fits her schedule to accommodate the needs of the mother and loves working with infants. 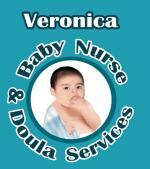 I highly recommend Veronica for newborn and infant care. We contacted Veronica for Newborn Consultation and sleep training for our foster/adopted son who is now 12 weeks! The trusting, caring, successful work of Veronica is why my wife and I chose to work with her upon the first meeting! In our special case, we knew from the moment we met Veronica, she had the right tools to manage our special situation with understanding, love and kindness. We knew we needed someone we could trust as well as providing us with the best care in order to get our son to sleep through the night. Veronica came in, set up a wonderful bedtime routine and had our little guy sleeping soundly in his crib for the first time since bringing him home! All her knowledge really comes into play during the night sessions, teaching us more than you can ever dream of!